Designing a house is difficult. Four years ago when I began, I knew virtually nothing about fireplace design. 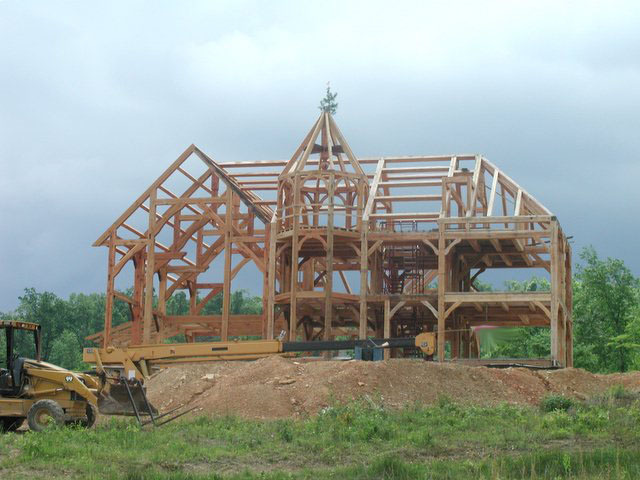 I made accommodations for the fireplace within the timberframe and foundation, but I neglected to include provisions for the fireplace hearth. Ideally, if I could have known everything back then, I would have poured a cantilevered concrete ledge to support the hearth. As it were, I simply framed the house as if the hearth did not exist. I built concrete forms using aluminum extrusions and hardi-panel cement board. By using fireproof materials, I could leave the forms in place after the concrete cured. Into the forms, I placed reinforcing steel bars and drilled holes into the existing concrete so that the rebar (not the forms) could support the hearth slab on its longest side once the concrete cured. I mixed the quickrete in 5 gallon pales and added two extra shovels of portland cement to each bucket for extra strength. The kids had fun putting graffiti into the concrete... too bad all of that got covered up! After the concrete setup, my wife and I had a crazy idea... one of those ideas that takes a one day project and turns it into a one week project. 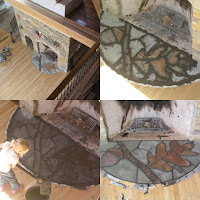 "Why not put some kind of pattern into the flagstone hearth?" I sketched a few ideas... Gothic arches in the grout lines, a Rising Sun pattern (the hearth faces east), and an oak leaf motif. We settled on the oak leaf. My wife cut out a piece of cardboard the size of the hearth and I sketched a pattern on it that satisfied both of us. To avoid creating a dust bowl in the house, I took the cardboard pattern outside and cut the stones in the back yard using a gas chop saw and an angle grinder. It took two days to cut the stones, but that included a trip back to the creek to search for more blue silt stones of a uniform color. I mortared the flagstones down to the concrete hearth using generous amounts of thinset where necessary to level the thinner stones. Then I smeared dark gray grout into the joints, and followed up quickly with a wet sponge and progressively cleaner buckets of rinse water. We were out of "grout easy" so I tried to clean the grout off quickly before it had a chance to stain the flagstones. I used masking tape on the finished ash floor to avoid staining it with grout. As usual, our four year old wanted to help, so she grabbed the shop vac and vacuumed up the bits of dried grout on the floor. The hearth stones haven't been sealed yet, but that hasn't kept me from starting fires in the fireplace. Here's a picture of the final, if not somewhat dirty, hearth design with a fire in the firebox. Yes that's a timber cut-off in the fireplace -- I have a few of those laying around. Incidentally, the Rumford fireplace works fabulously. I have never seen an open fireplace that works this well, although I'll readily admit that fireplace inserts give off much more net heat. The fireplace draws wonderfully and lets no smoke into the house, even when the flue is cold and the fire is smoky. The only fault I can find is that it draws so well that it's clearly sucking lots of air out of the house. Although I neglected the hearth in the plans four years ago, I did include a cold-air make-up supply beneath the firebox. When I get that plumbed to the outside, the fireplace will be able to fuel the fire with outside air instead of warm inside air and I think that will contribute to the net heat output of the Rumford. For now, it burns a beautiful flame and radiates warmth! 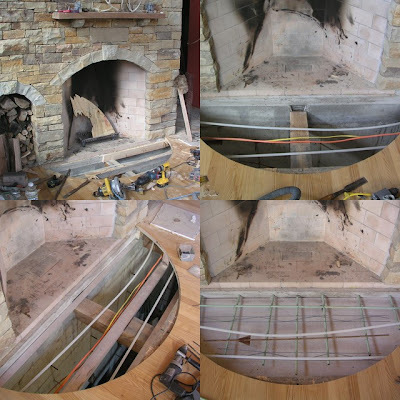 The preceding post in this Rumford fireplace series can be found here. In New Hampshire, we lived with a drilled well, but back here in Kentucky our mobile home is connected to "city water." Both sources have had their drawbacks. For our new house, I have resolved to provide our own "drinkable" water. Water for the toilets and water for laundry will come from a cistern that collects rainwater from our slate roof. Drinking, cooking, and bathing water will come from a well... hopefully! With the notable exception of possible bacterial contamination, it is my opinion that better water comes from a dug well than from a drilled well. The best water I've tasted on our farm has come from (ephemeral) surface springs, so maybe the second best water will come from a dug well. The deeper into the earth you go, the older the water. Old water from deep in the ground has had time to pick up heavy metals, radon, arsenic, sulfur, and even oil leached from shale. A dug well essentially provides rain water that has been naturally filtered by the top several feet of earth. At an elevation of 150 feet above the bottom of the nearest holler, our house is probably much higher than the natural water table. (a holler, more properly called "hollow, is a small valley.) To have a better chance of striking water, I went to the bottom of the holler and chose a spot to dig our well. To avoid getting surface runoff in our well, I chose a spot 30 yards from the small creek that runs through the holler. I invited my neighbor over to run the backhoe while I watched intently in the hole we created in the earth. In the two months preceding this effort, we received practically no rain, so this seemed to be the perfect time to find a reliable source of water. In the first seven feet, the ground was so dry it was almost powder. In fact, we had to stop digging a few times to let the dust settle so we could see into the hole. My wife visited with the kids and I admitted that things were starting to look doubtful. Shortly after family left, we busted through a thin layer of sandstone, and miraculously hit a stream of water amidst the dry dirt and clay. Water started seeping into the bottom of the hole from several points around the side. Possible success, and lots of excitement! "Taste it," my neighbor suggested. Looking into the muddy hole, my first thought was "yuck, no way", but then I realized I would be drinking this water for the rest of my life, so I cut the top off of a water bottle and jumped into the bottom of the hole. One of the seep holes was clearly beginning to run faster than the others, so I positioned my bottle there and collected a swig of clear water. Bottoms up! It tasted cold and wet... with a hint of metal. Shucks, iron water... but that is to be expected here. Just look at all of the orange tinged rocks on my house - iron is everywhere. That's ok, we can filter it. Just beneath the vein of water, we discovered a thick layer of rock. I authorized my neighbor to try and bust through it with the backhoe, since I felt I would need at least 3 feet below the water table to allow for reserve water, debris settling, and a pump intake. Three broken bucket teeth later, we declared the sandstone the winner and started to rethink the plan. The euphoria of striking water in the first hole was wearing off quickly as I sized up the stubborn bedrock just inches below the water vein. I borrowed my father-in-law's Hilti hammer drill and determined (by drilling several holes) that the layer of sandstone that had defeated us was at least 12 inches thick. In more innocent days, dynamite was easily acquired by farmers for such dilemmas. It didn't seem like an option for me. Two friends suggested I give up and just hire a well driller. No way! While I pondered the problem (for several days), I diligently pumped the well dry each morning and measured the amount of water. First, I wanted to make sure that we hadn't just hit a stored pocket of water that would be easily exhausted. Second, I wanted to make sure that the flow rate would meet the requirements of our house. I was able to pump about 100 gallons of water each morning, but the instantaneous flow rate was closer to 15 gallows per minute. I presume that once the water reached a certain level each night, the flow tapered off to zero, or else I should have been able to pump out 360 gallons each morning (based on the instantaneous flow rate). The well would provide enough water, but how to get through that bed of stone? After racking my brain, I remembered a local friend with a construction company. Surely he must have a jack hammer and the requisite diesel powered air compressor. I called him up and he said he would loan one to me. My neighbor and I took turns in the hole with the 90 (?) pound jack hammer working on the sandstone. My neighbor had some experience with a jack hammer (and I had none! ), so he went first and within an hour, he created the initial through-hole in the sandstone. We stopped occasionally to bucket the stone chips out of the hole. The first thing that impressed me about the jackhammer when I used it was the raw power and devastation it could render. It was like shooting a 50 caliber ma deuce into the ground... without ever running out of bullets! The downside was the collateral damage it could render to the operator's body. How people run these things day in and day out, I can not imagine. Shortly after my neighbor admonished me not to, I left the jackhammer running in one place too long... and got it stuck in the stone. Doooh! It took about 3 hours to create a 3 foot diameter hole in the stone. We spent the rest of the day hammering and clearing out hard-pan beneath the stone. The hard-pan was composed of a blue rocky-shale-like substance that turned to clay upon exposure to air and water. To keep us from getting wet, I ran a 12 volt RV pump from a dewalt battery pack, but it was still necessary to stop and bail out the hole at times. My friend needed his jack hammer back that evening, and I was never happier to return a tool in my life. My fingers would barely uncurl and the 90 pound hammer felt like 150 pounds when I lifted it back out of the hole and into my pickup truck bed. I searched in vain for ceramic well liners (big enough to climb into) that must have been a common item 50 years ago. One place advised me that they could probably order them, but that I should expect to pay at least $50 a running foot for them. I gave up and was going to settle for regular concrete tiles, so I went to our local farm store owner and asked if he could sell me something like that. "In fact," he said "I have three of those ceramic tiles sitting in my cow pasture... you can have them for free. Tractor's in the barn next to the pasture. Key's in it." Score! Within 2 hours I had those tiles back on my farm next to my dug well. Each one is 4 feet long and I estimate they weigh 800 to 1000 pounds apiece. The next steps in securing our water supply are to lower the liners into the well, install a pump, and bury a water line a pump wires up to the house (approximately 750 feet away). In the mean time, my kids are fascinated with the big hole in the ground. After spending a day myself in this hole, I felt it was safe enough to let the kids climb into it for a few seconds.